Fact: Bulgari knows how to throw a party. Last month, the brand's Oscars viewing party drew the likes of Sofia Richie and VS Angel Lais Ribeiro, and its latest bash was similarly chic. Bulgari just celebrated the release of its new perfume, Omnia Pink Sapphire, with the three faces of the launch: Margaret Zhang, Madison Beer, and Amanda Steele (along with other chic guests). To get the scoop on the L.A. party, we went straight to the source and got a behind-the-scenes look from Margaret Zhang. The Instagram It girl shared exclusive Polaroids with Who What Wear, showing everything from hair and makeup to the final look wearing a Retrofête dress. Read on to see her Polaroids, as well as other stylish guest outfits from the event. "Final touches from maestro hands Kate Lee and Dave Stanwell," Zhang told Who What Wear. 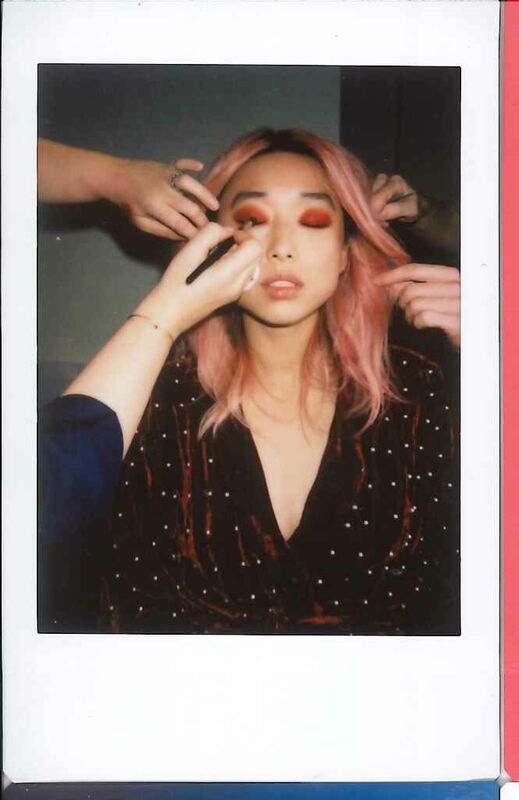 "I've been blonde for the past year and a half and secretly went pink for the campaign shoot last year, so I am gearing up to experiment with every shade variation," Zhang told us. "Testing, testing—final look on the balcony: Rosetta Getty fringes, Jonathan Cohen pants, and the checked blazer I literally wear every day of my life." "The face arsenal: Kate Lee's red-eye secrets." "Kaleidescope eyes—all the better to see you with, my dear." "I am so fascinated by Bulgari's heritage and craftsmanship: Obviously, the Serpenti is so representative of that. Definitely didn't want to give these back—but alas, Cinderella story."